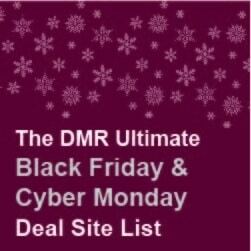 In what has become an annual tradition at DMR, below is my list of brands and retailers that are offering Black Friday and Cyber Monday deals for 2018 . I have been doing this for four years now and I hope you find it helpful. Here are all the Black Friday and Cyber Monday deals and sales for 2018 that I have been able to dig up thus far. I’ve done all the work for you, so you can just click and shop! This is just the beginning and I will be adding more listings as next Friday and Monday near. Be sure to keep checking back for more listings. Also good to note: You may find that some of the Cyber Monday pages linked below are a bit light in content at this early stage. They are mostly placeholders for their Cyber Monday deals. Also, some retailers use the same page for Black Friday and Cyber Monday sales, so you won’t see any Monday content until after the Friday sale is over. Be sure to check back on Sunday or Monday for the actual deals and sales.